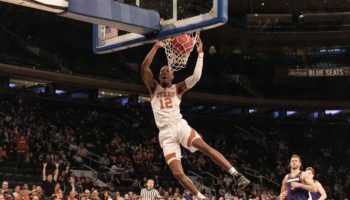 NEW YORK — Playing on the biggest stage that the game of basketball has to offer may very well be the tonic Florida guard KeVaughn Allen needed to regain the level he showed off two years ago, when many in the college basketball world thought he would ascend to becoming one of the best backcourt players in college basketball. The small-town guard from Little Rock, Ark. once again shined brightest while in the Big Apple, leading all scorers with 17 points during the Gators’ 66-56 victory over West Virginia in the nightcap of the 2018 Jimmy V Classic at Madison Square Garden. Allen’s two free throws started a 17-2 run that erased an early one-point second-half deficit, and his three-pointer capped that stretch of play and gave Florida a 47-33 lead with 10:21 remaining in the second half. Seven of Allen’s 17 points came during that surge from the Gators. 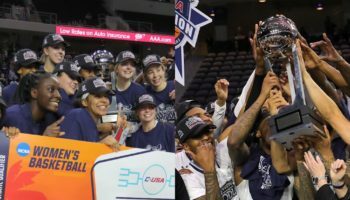 “We knew we had to come out and just match their intensity just to give us a chance to win the ballgame,” the soft-spoken Allen said in the postgame press conference. 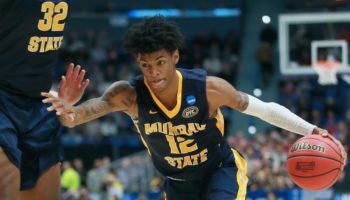 Two seasons ago saw Allen be named a First Team All-SEC selection, saving some of his best performances that campaign for when he stepped foot in The World’s Most Famous Arena; He scored 21 points in the 2016 Jimmy V Classic game against Duke and, at the end of that season, scored 35 points in an overtime win over Wisconsin in the East Regional semifinals of the 2017 NCAA Tournament. 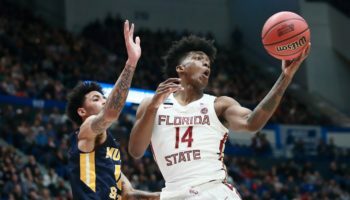 While the Gators made the NCAA Tournament last season as well, Allen’s numbers dropped precipitously, going from 14 points per game as a sophomore to 11 as a junior, and his shooting percentage dropped by almost eight points. Florida head coach Mike White is encouraged that tonight’s performance against “Press Virginia” could be a sign of things to come for Allen in his final season in Gainesville. Though the Gators struggled as a team on the offensive end, making just one out of three shots in the contest, they once again hung their hats on the defensive end, holding the Mountaineers to just 29.7 percent shooting (19-for-64). Florida was also much more aggressive on the offensive end as they wound up attempting 46 free throws — and making 28 of them — as West Virginia was just 11-of-20 from the charity stripe. “Our zone press has been pretty effective and our defense has been pretty good overall all year so far in this early season,” White said. Guard Chase Harler was the only player to score in double figures for the Mountaineers, scoring all 11 of his points — including three 3-pointers — in the final 4:57 of the second half. Star forward Sagaba Konate had only four points on 2-of-10 shooting and six rebounds before fouling out. West Virginia also committed 21 turnovers. “We have some guys who need to grow up, and if they don’t do it then I can’t have them around,” said West Virginia head coach Bob Huggins. The loss snapped the Mountaineers’ four-game winning streak. Florida will look to add another signature victory this weekend when it takes on No. 10 Michigan State at the O’Connell Center on Saturday at noon.